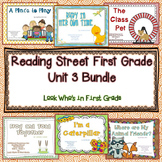 This is a bundle of SMART Notebook lessons aligned with the Reading Street program for 1st grade, Unit 3, Week 2. 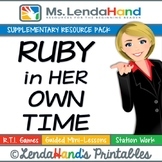 Included are lessons for each of the 5 days within the week, which features the story Ruby in Her Own Time. Are you in need of a literacy center that correlates with your weekly Reading Street story? This activity is certain to meet that need. It is specific to first grade. This product contains 6 scrambled sentences that reinforce the phonics skills/high frequency words introduced in EACH weekly story.